Depending on the light, it can bring instant panic. Thoughts of being stranded and what to do next can fill our heads. Hopefully some help from roadside assistance can resolve serious issues. On the other hand, some lights can simply be a notification that something is working, but not 100%. With winter right around the corner, now is a good time to become acquainted with some of these warning lights. If you see a light appear on your dashboard, don’t panic. Symbol lights can appear in different colors. Red – indicates a potentially serious problem or safety issue and should be taken to your dealer as soon as possible. Yellow/Orange – something needs to be serviced or repaired soon. Green/Blue – indicates that your system is operating. You may see this color scheme when your headlights are on. If a light is flashing, contact your local dealership or trusted mechanic. Your spark plugs or wires need replacing. These items all affect how efficiently your car runs. 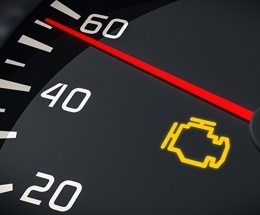 The light does not mean your engine is going to explode or is low on oil. 2. Coolant Temperature Warning: This warning light indicates that your engine is overheating due to lack of coolant. If this light comes on, pull over immediately and turn off your car. An overheated engine can cause significant damage. Before checking your coolant level, let your car cool down 30 – 60 minutes before removing the radiator cap to prevent burns from steam buildup inside the radiator. While you’re waiting for the engine to cool down, look under your car to see if there are any leaks. Your car may be fine but the coolant is low based on the intervals in which the coolant has been filled up last. 3. Oil Pressure Warning: This light identifies a loss of oil pressure. Immediately and safely, pull over and turn off your car. Low oil pressure could lead to serious engine problems. The easiest check is to pull out your dipstick and wipe it with paper towel or cloth. Then reinsert the dipstick and remove it to check oil level. If your oil is low, you could be over the recommended oil change interval or have a leak. Don’t drive it until you put more oil in. 4. Tire Pressure Monitoring System (TPMS): This light signifies that a tire pressure is low. It could be low due to a change in temperature, or damage to the tire. Maintaining appropriate tire pressure is important. Driving with under or over inflated tires can be dangerous. If your car begins driving poorly, pull over immediately. Driving on a flat tire can damage your rim and lead to more expense. 5. Battery/Charging Alert: This light indicates that your battery’s voltage level may be below normal level. This could be the result of an old battery or other deteriorating parts such as the starter, corroded battery terminals, or an alternator. 6. Traction Control or ESP: This light illuminates when your vehicle is experiencing slippery or treacherous conditions. Systems in use could be your traction control, anti-skid, or electronic stability control. If you notice this light on please slow down and drive appropriately for the conditions Mother Nature is throwing at you. 7. Brake System: This light indicates that your parking brake may be on, or there is a problem with your braking system such as low brake fluid or issues with your ABS. One of the most important feature on your car is your brakes. Make sure to get this checked out right away. For additional information on your car’s warning lights, please review your owner’s manual. If you don’t have roadside assistance, now may be a wise time to check into it. As part of West Bend’s Home and Highway® policy, TravelNet® can provide assistance for towing, flat tires, gasoline delivery, battery jumpstarts, lockouts, and other minor repairs at the site of disablement.